At the top of the house this room gives you the 2nd floor all to yourselves. A beautiful room offering uninterrupted panoramic views across to Clodgy Point, Porthmeor Beach, The Island and out over the open ocean. The room has been furnished to reflect the colours of the sea view to create a space where you can unwind, relax and just enjoy your surroundings. You can take your ease and watch the boats sail by either from the comfort of the king size bed or from the easy chairs in your bay window. The beautifully appointed ensuite has a bath and a powerful overhead shower, fluffy bath sheets and luxurious toiletries. 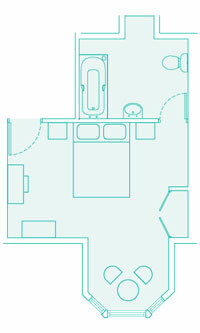 The room, including the ensuite, is 25 sq.m.